We were asked to create a vintage-inspired “manor-style” dinner jacket/tuxedo ensemble for a wedding set in a historic manor in Orange County, California. Our client wanted the construction to have a vintage feel and finish but display a more modern, slim cut that matched his slimmer frame. He was looking for an alternative to the standard white dinner jacket and briefly considered the “bruiser” (black and navy blue) dinner jacket, but he felt that the piece would strike the wrong note in the wedding’s 1900s manor setting. 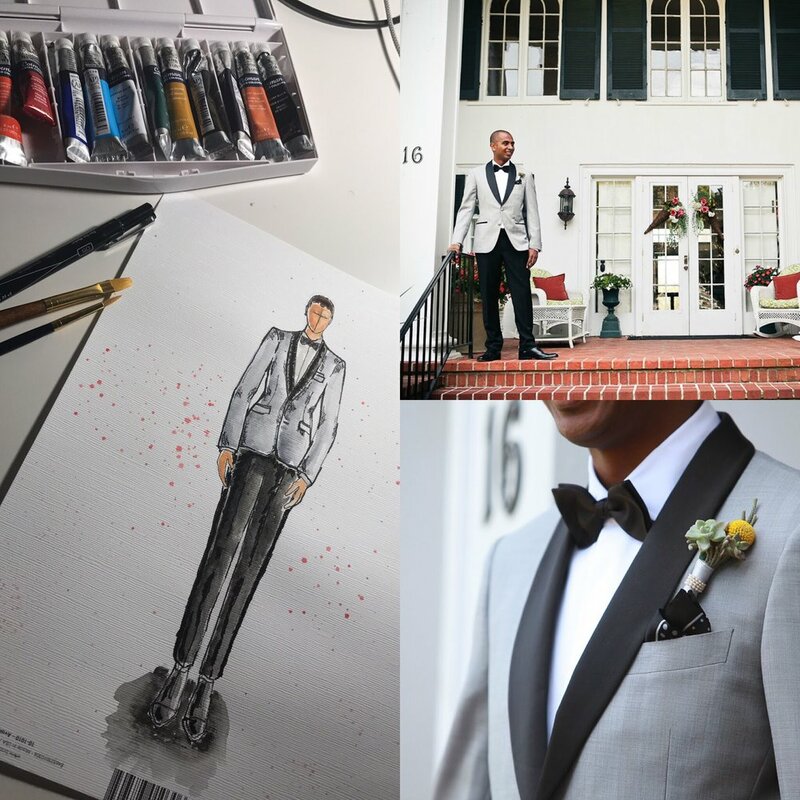 From Sketch to Finish: A one of a kind custom bespoke gray dinner jacket. The fabric was crucial to the design: we sought a very specific shade of light gray. After looking through a few dozen swatches, we came to a wide herringbone weave fabric in just the right tone. The weave was so slight as to be virtually invisible to the camera, but the faint texture added an iridescent quality to the fabric’s finish, which created a slight cool blue tone. This fabric was to be paired with an open-weave matte black for the trousers. The tuxedo shirt featured a two-ply 150’s Sea Island cotton/linen blend, which gave the custom garment a textured, vintage feel. The jacket was to feature a two-button shawl lapel. Generally, shawl lapels feature a one-button closure, but we selected a two-button design. Why? To create a sportier feel, so that the jacket would have greater wearability as a sport coat for more casual settings after the wedding. Contrast black satin was to be placed on the lapels and pocket besoms, while the buttons were to be covered with the same gray fabric as the dinner jacket’s body. We chose this color placement to minimize the contrast “pop” between the gray fabric and the black satin. The contrast black tuxedo trousers featured adjuster-buckle enclosures on the waist and a more modern single 1/4” satin stripe down the leg. The tuxedo shirt was made with a pique bib front and a widespread turndown collar, to be worn with a bowtie, French cuffs, and a fly-front placket to cover the buttons, as the client preferred not to wear studs. The cut was pretty straightforward. Originally, the client had stated that a slim cut was his preference, but upon further discussion we came to the understanding that he was simply looking for something more proportionate to his frame. Usually our client’s slim build meant that off-the-rack suits were too baggy, even when he purchased a “slim cut” version. Our client wanted his suit to appear classic and well-fitted, but he didn’t actually desire the overtly slim feel of a “shrunken” suit like those cut by designers such as Thom Browne. Matching his actual frame was simple and created a pleasing tailored look for the completed tuxedo without overt trendiness.